The Labradoodle—a hybrid breed—first made its appearance in Australia when a few breeders set out to produce a hypoallergenic guide dog. Wally Cronron, an RGDGA associate (Royal Guide Dogs Association of Australia), crossbred a purebred standard poodle with a purebred Labrador Retriever. The first Labradoodle was a dog named Sultan—who first came to existence in the late 20th century—bred for the purpose of allergic owners in need of a guide dog. With astounding success, Sultan had both a hypoallergenic coat and the intelligence to be trained as a service dog. Wally then teamed up with a partner in Hawaii, and the two worked to establish the Labradoodle as its own breed. Currently, multigenerational breeding is being conducted in hopes to iron out and stabilize the Labradoodle breed. However, at this point, there are no ‘true’ purebred Labradoodles in North America. This, of course, means the Labradoodle breed is not registered with the AKC. Unfortunately—as time passed and more Labradoodles were bred—Cronron realized that the crossbreed is inconsistent. For every passable, hypoallergenic guide dog produced, there are more ‘failures’ than successes. Streamlining the breed is currently a work in progress, stagnated by the array of incompetent breeders trying to create their own Labradoodles. While the Labradoodle’s temperament and personality can fluctuate drastically due to the ineptitude of breeders trying to jump on the bandwagon, the multigenerational Labradoodle does demonstrate stable Labradoodle characteristics. Known for their intelligence, calm temperament, affection, extroversion, and elegant gait, the Labradoodle is a fantastic home dog. In fact, the Labradoodle personality is so affectionate and sociable, that they often need to be trained to mitigate their abrasive excitement for life. Due to their intelligence, they process information rapidly, and are often quick-witted canines. They enjoy playing with a passion, but are often not pushy and their keenness and intuition allows them to judge when it is play time and when it is not. Early-socialization, heredity, and the amount of training administered affect the extent of extroverted Labradoodle behavior. It is important that with these dogs they are introduced to the world, other people, and canines early on. This not because they can develop introverted, timid, or reclusive personality traits. Rather, it is to create boundaries within their own tenacious affection and prevent Labradoodle temperament problems. They are by in large a great choice for a first-time dog owner, a family, and a guide dog. Training a Labradoodle is an easier task than most dogs. Their eager-to-please personalities and intelligence make them both attentive and dexterous in learning. Their overt friendliness, intuition, and slight sensitivity mean they respond best to positive reinforcement. Praise for good Labradoodle behavior in the form of treats, words, and playfulness work best when training a Labradoodle. Despite being home dogs, the Labradoodle will need excessive exercise—particularly in the puppy ages—to meet their high threshold of energy. One of the most important parts of training a Labradoodle is exposing them to other dogs early on. They’re social to the extent that they will throw themselves headfirst at other canines, without any regard to the stranger’s feelings. This inability to discern between appropriate and inappropriate canine interaction will become a problem if not treated early on. Their intelligence needs to be stimulated and manifested. Don’t limit the training process but instead reach above and beyond. This means teaching tricks, games, and a slew of commands to keep them engaged. A lack of mental and physical situation will result in a tireless Labradoodle. A tireless Labradoodle tears the home apart and develops high levels of nervousness and anxiety. A Labradoodle should be potty trained and housed indoors. These are people dogs. They long for the comfort of their owners and a home. Also, crate training is exceptionally successful with this breed. A Labradoodle requires 30-60 minutes of exercise per day. These dogs have a surplus of energy. They’ll need an outlet to release it. Their need for activity and large size make them a perfect fit for a house with a yard, but not an apartment. They’re great walking companions and will keep up in a run. As with most breeds, their need of exercise will dwindle over time. A puppy Labradoodle, dependent on its heredity, will either be a bit more stagnant, or a bit more jumpy. Meaning it’s a tossup whether or not a Labradoodle will be highly active, or moderately active. They’re also natural swimmers. Put them in water and watch them shine with glee. When exercising, incorporate games and ‘educational playtime’ to not only exercise their bodies but their intelligence as well. A Labradoodle lifespan typically ranges anywhere from 12-14 years. While Labradoodles have had a rapid rise in popularity in the last decade, they remain unregistered in the AKC. Breeders are currently trying to streamline the Labradoodle and create a common multigenerational breed. The issue is that—due to their rapid rise of international popularity—lots of incompetent breeders try to produce them by crossbreeding poodles and Labradors or Labrador Retrievers. This unfortunate rush to meet demand has started a chain of puppy mills, where the Labradoodles in question are often poorly bred dogs, with bad temperaments, personalities, and prone to health issues. Once the success of multigenerational breeding becomes apparent, and the breed begins to show credible consistency, they will become more popular in America. The amount in which you feed your Labradoodle depends on its size, metabolism, and activeness. Similar to the human anatomy, no two Labradoodles will be the same. It’s important as an owner to understand the dynamic of your dog, purchase high-quality food, and monitor the amount served. Generally, a Labradoodle should eat two cups of dry food per day, broken into two different meals. However, the Labrador Retriever commonly experiences gastric torsion—in simpler words: bloating—a condition which can passed along to Labradoodles. To avoid this problem, be sure to break the meals precisely in half and space them out with ample time between each course. For Labradoodles, never leave food out perpetually. Make sure each meal is administered and eaten before proceeding to the next. As puppies they might—but often don’t—require more food than adults. A good way to ensure your Labradoodle is receiving the proper amount of food is by pressing against their ribcage. With minimal force, you should be able to feel their ribs. If you have to press hard, lower the food intake and up the exercise. 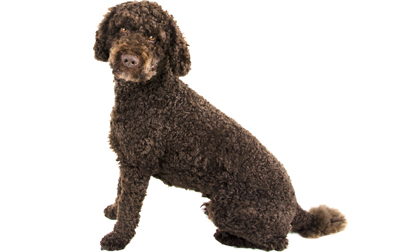 The hybrid Labradoodle and its peculiar ancestry cause an inconsistency in their coating. Point being, they tend to range. Typically, the coat is around 4-6 inches with either curly or straight hair. The proper coat is neither course, thick, or prone to fluffiness. Their coats are wool, hair, or fleece, with the latter being most coveted for the breed. These coats can be gold, caramel, cream, black, red, chocolate, and blue colored. A few have parti-colored coats. These coats are supposed to be hypoallergenic, but due to the excessive attempt breed Labradoodles, they’re often falsely advertised. These dogs need grooming. Depending on the coat, others will need more, but generally speaking, they should be brushed twice a week with a bristle brush to keep their coats clean and mitigate shedding. There should not be a routine bath, and rather bathe the Labradoodle as needed; they tend to be less prone to odor than other dog breeds. For optimal Labradoodle health, brush their teeth three times per week for hygiene upkeep. This will avoid bacteria and tartar buildups. Trim their nails twice a month, as this breed is fond of scratching. Due note, Labradoodles’ blood vessels tend to extend further in the nail than other breeds. Be careful not to cause bleeding. Conduct checkups; check the ears, mouth, nose, and coat for inflammation, redness, and infection. Are Labradoodles Good with Children? Labradoodles are exceptional with children. Their exuberant energy, eager-to-please attitude, and playfulness make them the perfect child’s companion. In their puppy years, dependent on their size, they can often lack spatial awareness and play ‘too hard,’ thus knocking over smaller children. But due to their keen ability to learn, with proper training it shouldn’t be a problem. As with all dogs, it is important to train the dog all the while teaching the children what’s involved in handling them. A mutual respect and understanding needs to be developed. Hip Dysplasia: this condition occurs when there’s displacement between the thigh bone and the hip joint. It can cause lameness in the leg(s) and can worsen to the point of immobility. At the very least, the Labradoodle is affected but does not show symptoms. A screening can be done to ensure the parents do not have Hip Dysplasia, as dogs with this condition should not be bred. Check with your breeder to see if the parents have been screened. Elbow Dysplasia: in the same vein of Hip Dysplasia, this condition occurs when there’s displacement between the bone and the elbow joint. It can cause lameness in the leg(s) and at the very worst immobility. It’s often attributed to abnormal growth, resulting in a poorly formed elbow joint. The list of treatments ranges from simple weight monitoring to surgery. Epilepsy: this neurological condition is most commonly inherited. In short, it causes seizures. In the dog world this means they will run frantically from ‘ghosts,’ hide for hours on end, walk with an abnormal gait, or cease to remain with their usual keenness. Seizures can be caused by a variety of different external factors, thus it’s important to have your Labradoodle diagnosed if you believe they have epilepsy. Diabetes Mellitus: similar to commonly known diabetes, this occurs when the dog’s body cannot regulate its blood sugar levels. A Labradoodle with this condition will be glutinous about their food in hopes to compensate for their lack of energy. Meaning they will not receive the proper energy from their food intake, and will decide that more food is the solution. Even then, they will lose weight, remain lethargic, continue with their unappeasable appetite, and urinate constantly. This condition can be mitigated by managing diet and administering insulin if needed.